Ready to save a bundle on that next sofa or couches you’ve been eyeing all season? There are some major sales going on this way! You may be looking to nab a killer deal on a sofa right now, but when is really the best time to buy one in order to save as much as humanly possible? A recent study claims that there are actually two times of year to save the most. Those months are January/February and then again in August/September. This is mainly because retailers (including online retailers) are typically providing the best discounts in order to make room for the latest and greatest trends in all things couches, sectionals, sofa beds, and more. We think that right now may be the best time to buy because we’ve combed through the ever-loving depths of the internet to find some of the most amazing deals at trusted retailers like Wayfair, The Home Depot, IKEA, All Modern and more. The best part is that some will even give you a little extra incentive by providing you with anywhere from an extra 10% – 20% off your purchase if you’re a new customer or are new to signing up for their emailed newsletter. Add that to their current sale prices and you can save, on average, anywhere from 30% – 60% off originally priced comfy options. 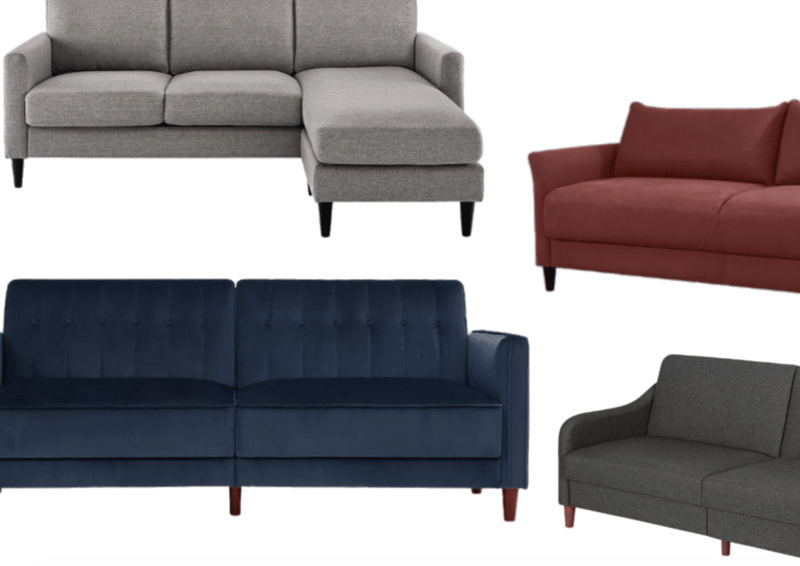 Check out some of the best sofas and couches for sale (so far) in April 2019. Wayfair Sale Alert: If you're looking to save a bundle, right now you can save up to 40% off select couches perfect for just about every living room from large to small and everything in between. There's nothing better than super comfy and buttery soft leather! Right now you can save up to 45% off select genuine leather living room and family room pieces. Many of these are also offering free shipping too. Score! If you're looking for really chic modern and mid-century modern options, there's currently some killer deals going on right now. Take up to 25% off select originally priced options today! If you're looking for the most comfortable sleepers at some of the best prices, you're in luck this month. You can get up to 30% off select sleepers and many with FREE 2-day shipping. What's better than that?! You can save a bunch on a super wide variety of sofas from sectionals, to sleepers, convertibles, sets, recliners and more. Did we mention many are up to 40% off the original price? And there are currently over 500 of them on sale today! The Home Depot has a really great variety of living room and family room pieces perfect for just about any home. Right now many of these are up to 20% off! You can choose from traditional, moderns, classic, farmhouse, cottage, transitional, mid-century and more! IKEA has a ton of amazing options this month and many are starting at under $300. How can you go wrong with that?! Choose from modern, two-seat, sectional, transitional and more!